Fighter pilot's issue survival knife/Military issue. As seen on the "LOST" TV series. The Tekna Wilderness Edge is the ultimate survival knife. 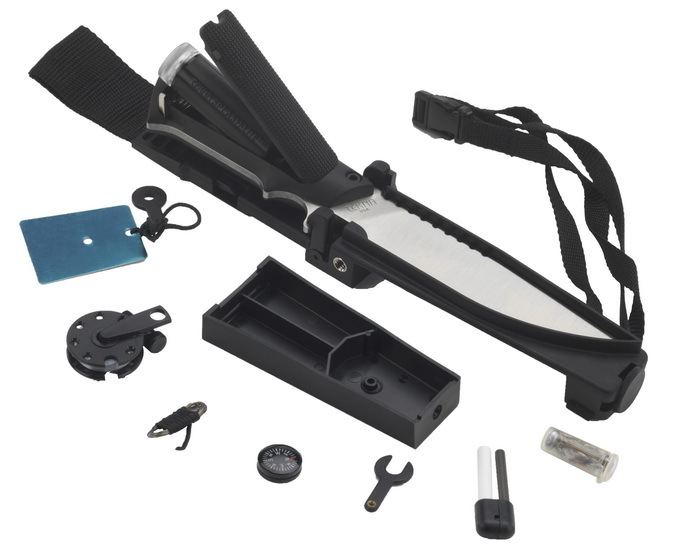 The TEKNA® Wilderness Edge™ improved version is the ultimate survival knife and kit. You'll never worry about getting lost in the woods again because the Wilderness Edge™ includes everything you need to catch and prepare food, start a fire, find your way, see in the dark and signal for help. Perfect for Military, Scouts, preppers, bushcrafters, and survivalists, or for anyone who just wants to be prepared! It contains the essential gear to save you from a disaster, it could save your life in an emergency. Includes Eagle Claw® split shot, Norweigen Mustad® fishooks, US-made flys. The original Tekna company, formed by talented designer and entrepreneur Ralph Osterhout in 1978, was broken up and sold in 1990. This unfortunate situation resulted in product lines being sold to various manufacturers. Most of the flashlight products went to Ray-O-Vac (discontinued in the early ’90’s); an ex-Tekna design engineer bought most of the knife line (Roger Moriano, RAM Design); and the scuba products went to the new Tekna/Ocean Edge scuba company (later Ocean Reef). The Tekna underwater vehicle was eventually purchased by Oceanic. TEKTITE became involved in 1990-91 by making diving flashlights for the new Tekna/Ocean Edge scuba company that was formed by leading scuba industry executives. From the outset, we were regularly asked about the availability of parts and service for Tekna items, and we began offering limited Tekna replacement parts and service in the mid-1990’s, as well as some direction for owners whose products we could not assist with. Over the years, we have added to this list, and began distributing the Tekna knife product line as well. In 2004-06 we purchased the original Tekna knives production tooling and inventory from companies in Europe and the U.S., and arranged for the production of the knives, flashlights and parts contained herein. In many cases, the original Tekna vendors supply components for these items. We are the world’s leading experts on the original Tekna flashlights and knives, with our human resources including original Tekna dealers, service techs, production vendors, and design engineers. We offer the most comprehensive parts inventory and service for Tekna Knives and flashlights available anywhere. We offer 21st Century LED upgrades for most classic Tekna flashlights, so you can keep your beloved Tekna Lites, AND have modern performance and battery cost saving, too. We have added additional products, including additional improvements to the classic Tekna designs. The new Tekna flashlight designs offered here are where Tekna would have been in the 21st century. We manufacture the best, most rugged, U.S. made LED flashlights; we have the patents to prove it. Tektite’s patented LED technology applications have secured Tektite with the largest LED flashlight offering worldwide and the recognized leader in the industry. Tektite Industries, based in Trenton, New Jersey, U.S.A., manufactures and distributes LED flashlights, LED replacement bulbs, HID lights, dive lights, strobes, signaling lights and knives serving customers demanding the most rugged products in the Outdoor, Industrial, Public Safety and Military markets. Tektite® is a registered trademark of Tektite Industries, Inc. Founded by current ownership in 1990, Tektite manufactures a product line featuring more than 200 SKUs. Our TEKTITE brand lights and strobes are made in the U.S.A. and feature HIGH-TEK™ lamps, space age polymers, computer-designed reflectors and other features that makes Tektite the best choice when quality, reliability and performance is required. Tektite licenses its patented technology to well-known names in the lighting industry and provides Private Label and Custom Solutions.